Boxes are delivered on a set day each week, depending on your delivery address. 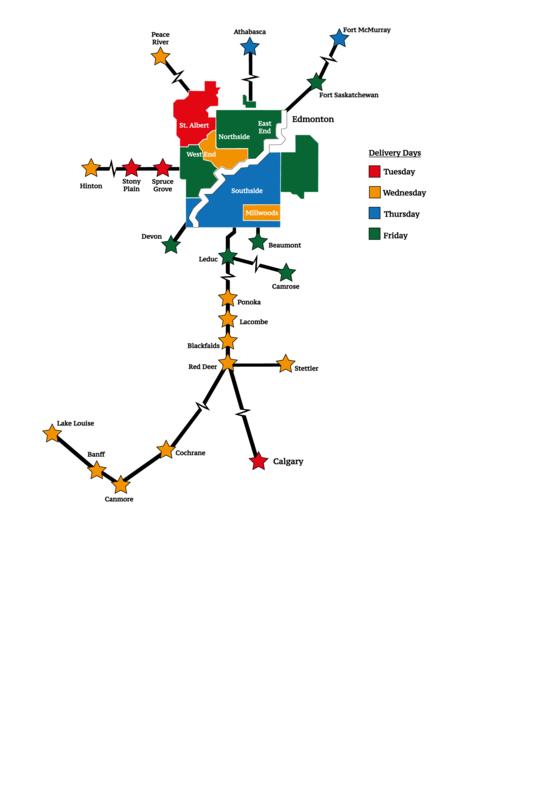 This map represents a basic overview of the regions we currently serve along with their respective delivery days. For some smaller communities or remote rural areas, we offer click and collect locations. The Organic Box is excited to offer our special food and service to communities in Central and Northern Alberta through our Community Ambassador program. If you would like to help bring The Organic Box to your community, please take a look at our regional program and learn how your family can join ours. We're more than just organic food delivery. The Organic Box isn't just a local organic delivery service. We offer lots of helpful tips on food storage, plus recipes, blogs and so much more!